Metro-Ongen were formed in Tokyo in 2002. Combining lullaby melodies and lush harmonies with a new-wave sound that has been compared to Blondie and Television, Metro-Ongen have steady gained a devoted fanbase across Japan. One show at Osaka’s Minami Wheel Festival (the Japanese answer to SXSW) was so over-crowded fans had to be turned away. Moreover, with regular VJ performances at their shows and a poster design that won a 2010 New York design award, the band are evolving into an art collective under the banner Team M-O. Master Drumer that has inherited the DNA of traditional musicians from Ghana. He was born and raised in a prestigious family of musiscian that has had a long history of producing traditional classical instruments in Accra, the capital of Ghana in South Africa. Belongs to the Kpanlogo World Music CO., LTD. He promotes Ghana’s culture in schools with his performances. He performed along renown Japanese musicians, such as Yosuke Yamashita, Fumio Itabashi, Kazutoki Umezu, Sachi Hayasaka, Shuichi Hidano, among others. He also worked along Ryuichi sakamoto in “Scola – Sakamoto Ryuichi Ongaku no Gakko” NHK E). Born in New York City to diplomat parents, Elizaveta grew up in Moscow, Russia. She started playing piano and writing songs when she was five years old. When she turned 15, she left home and embarked upon a 3-year journey across Europe. She played piano and sang in seedy European nightclubs, studied herbal alchemy in an Italian monastery, and finished it off by attending the Prague Academy of Music. Her gypsy star then took her to Los Angeles, where she graduated from the University of Southern California with a degree in opera and music composition. In 2011, Elizaveta signed a deal with Universal Republic Records and immediately went into the studio with the multi-Grammy award winner and producer Greg Wells (Adele, Rufus Wainwright, Katy Perry, and Elton John) who helped Elizaveta hone her “opera-pop” vision and style. HAYASHI is a one man show, creating an orchestra of sound by layering vocals, guitar, effects, percussion, and electronic beats. The result is a mixture of Rock/Funk/Blues/Acoustic Psychedelic/Trance/Electronica/Dub/Jam and Jazz, with overtone harmonies on a rhythmic foundation. Born 1978.12/9, Tokyo, Japan KASHIHARA SHINPEI is an artist and designer whose works are based on the traditional Japanese art form of “suiboku-ga” (ink painting). Mixing media such as ink, acrylic gouash and crayons, his works evoke an eastern sense of beauty. Works include interior decoration, live paint performances in collaboration with musicians and textile design. He has had many successful exhibitions within Japan and overseas and his tranquil yet powerful works are held in high regard. Kashihara aims for further communication and cultural development through his artwork. French media artist residing in Tokyo, Alexis does research on “Interactive Aesthetics” for Sony CSL. His works span data visualization to new interfaces for sound interaction. collaborating on tracks together and then went on to start an event production crew, dos・ing. dos・ing, short for dreaming of sleeping, has planned events at many different venues; from Shisha lounges & small bars in the Shimokitazawa & Shibuya areas to night clubs in Aoyama & Shinjuku. They recently released their first track on Korean-based collective Pute Deluxe’s compilation “JOE” and also performed at the release party which was held at the Cakeshop in Seoul. Electric Candy Sand & Steffen¥oshiki are currently working towards more music releases not just for themselves but for other members of dos・ing. They plan to continue producing events all over Tokyo. This&That Cafe is a periodic event open to the public in which artists from all genres and backgrounds donate their time and talents in the spirt of sharing. It is a place where music and visual arts meld in unexpected collaborations. A forum for artists from afar to meet with local luminaries amidst the dense and eclectic pool of talent in Tokyo. A venue to gather, exchange ideas, share artistic inclinations and wax poetic in a causal community of old friends and new acquaintances. Come early to get a seat and take advantage of the fetching fare on the SuperDeluxe menu, or just pop in for a drink on your way home from work. All are welcome. 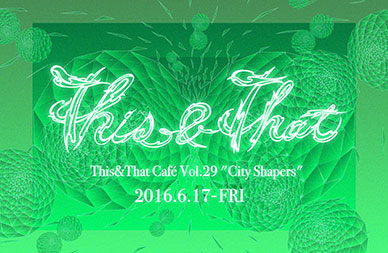 If you have an idea for a future This & That Cafe event, please drop a line to <[thisnthat@tokyodex.com](mailto:thisnthat@tokyodex.com)>. We look forward to hearing from musicians, DJ, visual artists et al looking for a new and exciting venue for their expressions.